I’ve wanted to do a “battle of the best” for a while. I always loved Sunday mornings on V103 here in Chicago with DJ Herb (The Cool Gent) Kent: Every Sunday he does battle of the best between two similar artists playing some of their best songs. Here is a take on the Battle of the Best except this is a “Who did it better”: One song, two artists, and you to vote on who did the song better. First up is the wonderful master and living Motown legend, Stevie Wonder. When Stevie sings “With a Child’s Heart” he takes you on a journey of your childhood. It has that great Motown Mid-Tempo feel, where you can do your two-step or just rock side to side in your seat. Vocally it’s classic Stevie, stretching for the big notes and delivering melismatic wonders. Stevie’s voice is youthful but it’s like a young adult looking back onto childhood. Remember when you first realized you were really an adult and it’s not that you want to go back but it makes you smile when you do look back? Next is the late King of Pop and Motown legend in his own right, Michael Jackson. Michael’s version of “With a Child’s Heart” starts out a little slower as he looks upon childhood. If you didn’t know Michael’s history of missing out on a lot of his childhood this version would confuse you. How can such a child like voice sound like he’s looking back on his childhood? Vocally Michael is as smooth as butter and as soulful as Stevie. However, Michael version is sad a version. He’s missing being a child and it damn near will bring tears to your eyes. Even as he sings “Nothing’s going to get me down”, you sense that he’s not telling you but he’s trying to convince himself. What do you think? It’s so hard for me but let me point out that Stevie did it first in the 1960’s and Michael later in the 1970’. You can hear the difference of both arrangement and production. I’m a big fan of 1960’s musical arrangements and therefore I’m going with Stevie. I like the happier tone too. I love Stevie, but I'm going with MJ. He sang it so beautifully and with such feeling. It's one of my favorite songs by him in his Motown solo years. Michael all the way buddy! 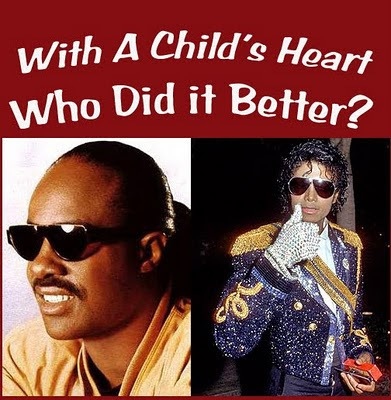 I stand by Stevie, I think Michael might just have the sympathy votes because of his death.